Going for the two-point conversion to win in a regular season game takes balls; going for two in overtime during a bowl game on a trick play? That takes balls of steel. 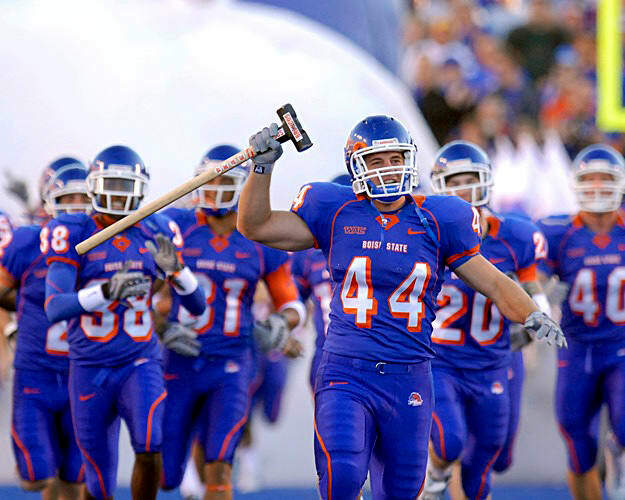 Upstart Boise State was already facing long odds when they squared off against Goliath Oklahoma in the &apos;07 Fiesta Bowl, and after scoring a TD to close to 42-41 in the first OT (after executing a flawless hook and ladder to tie the game in regulation), they could&apos;ve been forgiven for playing it safe. Instead, head coach Chris Petersen opted to run a "Statue of Liberty" on the two-point conversion, and beat the Sooners 43-42. If that wasn&apos;t enough, Ian Johnson, the running back that ran for the winning score, proposed to his girlfriend, a Broncos cheerleader, in the post-game interview. She said "yes." Successful proposal and Fiesta Bowl win in a 15-minute span? Ole, ole, ole, ole!